SECTION 1. The name of this organization shall be the Bunganut Pond Association, Incorporated. To perform all acts appropriate to a non-profit, scientific, literary and educational corporation dedicated to the promotion and development of environmental quality standards essential for the satisfactory life styles and conditions in the natural community. To preserve both the aesthetic, recreational and commercial value of freshwater, lakeshore properties through the maintenance and improvement of such environmental factors as watershed ecology, water quality, lake water levels, shoreline woodland management, agricultural soils practices, recreational and residential building standards, and relates influences, such as water and boating safety education. To conduct scientific research related to the lake environmental conditions, publish the results and conclusions derived therefrom and formulate management and preservation policies based thereon. To perform all acts and to have all the powers and to be subject to the limitations that may be conferred upon non-profit, scientific, literary and educational corporations formed under The Laws of the State of Maine governing Corporations Without Capital Stock and Section 501 (c) 3 of the Internal Revenue Code of 1954 as they are currently and shall hereafter be in force and effect. SECTION 1. 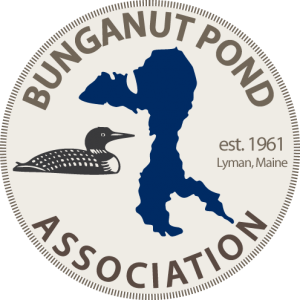 Any reputable person, association, corporation, partnership, or estate owning real estate on Bunganut Pond may be eligible for membership in the Bunganut Pond Association, Inc. SECTION 2. Membership dues shall be payable per family or organization by, on or after July 1 of each fiscal year. There shall be one vote per family or organization and only members whose current dues have been paid shall be eligible to vote. SECTION 3. Membership dues shall be the amount agreed upon by a majority of the members present at an annual meeting. SECTION 1. The government of the Association and the direction of its work shall be vested in a Board of Directors consisting of eight (8) members, four (4) Directors, the President, Vice President, Secretary, and Treasurer, all of whom shall be elected by the Association. The directors shall have power to fill vacancies on the Board. They shall meet not less than once annually, at such time and place as shall be determined by them. A quorum shall consist of not less than four (4) members. Two Directors shall be elected for a period of two years at the annual meeting. SECTION 1. The President shall preside at all meetings of the Association and of the Board of Directors, and perform all duties incident to this office. He shall, subject to the approval of the Board of Directors, appoint all Committees and he shall be an ex-officio member of all Committees. SECTION 2.The Vice-President shall act in the absence of the President, and in the absence of both the President and the Vice President, a member of The Board of Directors shall be chosen to act temporarily. SECTION 3. The Annual Meeting of the Association shall be held on the second (2nd) Sunday of July each year at a place designated by the President. SECTION 4. Twenty (20) percent of all the members in good standing shall constitute a quorum at all membership meetings. SECTION 1. The fiscal year will start July 1st of any given year and end on June 30th of the following year. SECTION 1. Robert’s “Rules of Order” shall be the parliamentary guide and shall govern the proceedings of the Association, the Board of Directors, and the Committees when not in conflict with the specific provisions of these By-Laws. SECTION 2. These By-Laws may be amended by the members of the Association at any annual meeting provided the members in good standing have been informed in writing at least two (2) weeks prior to such meeting, of the precise wording of the proposed amendment. SECTION 3. The Clerk or Secretary shall conduct the official correspondence, preserve all books, documents and communications, keep books of account and maintain an accurate record of the Association and of the Board of Directors’ meetings. SECTION 4. The Treasurer shall receive and disburse funds of the Association. No disbursements shall be made unless they have been authorized by the Board of Directors. SECTION 1. The Board of Directors shall authorize and define the powers and duties of all Committees. SECTION 2. The President shall appoint all Committees, subject to confirmation by the Board of Directors, for a period not to exceed the term of the President. SECTION 1. The Board of Directors may provide for holding special meetings whenever it may be considered necessary or advisable. SECTION 2. The Board of Directors shall call a membership meeting upon petition signed by not less than ten (10) percent of the members.